The town of Kinashi has developed and prospered as the center of Bonsai dwarfed plants, It started more than two hundred years ago when a local pioneer picked pine tree saplings he found on neighboring islands and cultivated them in his own special way and sold them. It has grown into a special product of the area and attracted the increasing number of Bonsai lovers across the country. The elegantly and magnificently shaped dwarfed Kuro- matsu and Goyo-matsu and the gracefully trimmed Nishiki-matsu are especially popular. Today the Kinashi's market share of the Bonsai pine trees in Japan is over 80%, and worldwide the number of lovers of this miniature beauty is ever increasing. For information about Bonsai, feel free to call Kinashi Garden Plants and Bonsai Center of Kagawa (148 Sato, Kinashi-cho, Takamatsu 761-8023). 2. Grand-Fair: March 15th, and November 15th. All visitors are cordially invited to these fairs to discover Bonsai of all sizes and all qualities. These are the biggest events where you can get Bonsai and products at bargain prices where they are cultivated. 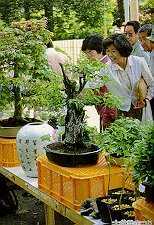 These events consist of an Exhibition of excellent Bonsai, Display with exhibits on sale, Sales of pots, Demonstrations of dwarfing, trimming and wiring of trees. Auction of Bonsai at the Festival Plaza, Lottery and many other attractions and many other joyful events. Pictorial essay of Stuart's Bonsai trip to Takamatsu, Kinashi & Kyoto in June 2005, fantastic pictures and a very usefull map of the Kinashi Bonsai Nurseries, Especially recomended is a visit to nursery #2 where the owners wife spoke fluent english. Mr Kandaka’s Bonsai nursery is described as the premier black pine nursery in Japan with many trees in his private collection going back 3 generations. Ritsurin Park is one of 6 of Japan's Daimyo Gardens, comprizing six ponds and thirteen miniature hills against the deep greenery of Mt. Shiun, reminds you of traditional Japanese paintings. It's located just 1 km south of central Takamatsu and has hundreds of styled and shaped pines and is well worth the visit if you have the time. Mr Iwasaki’s Japanese Garden and Bonsai Collection which consists of 100's of masterpieces are renowned in Japan. Unfortunately it is only open for viewing by private invitation.